Over 100 years ago Charles Edouard Guillaume, working at the International Bureau of Weights and Measures in France, discovered that certain alloys did not expand when heated, a behavior that came to be known as the Invar effect. Guillaume's discovery found immediate and lasting technological applications, and he was awarded the Nobel Prize in Physics in 1920. Guillaume's original work was carried out on an Ni-Fe alloy, but thermal Invar behavior has been found in a number of other alloy systems, all of which require precise control of composition. 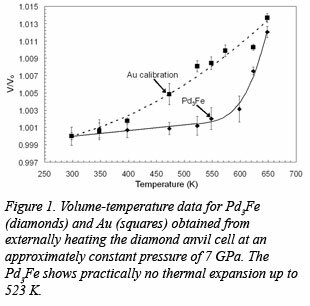 Researchers from the California Institute of Technology, the National Synchrotron Light Source, the Geophysical Laboratory, and the Advanced Photon Source have discovered Invar behavior at high pressures in Pd-25 at.% Fe, a composition far from the Invar composition of Pd-75 at.% Fe. 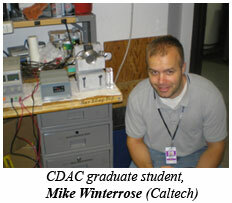 The group, led by CDAC graduate student Mike Winterrose, used density functional theory calculations, energy-dispersive x-ray diffraction, and synchrotron Mössbauer spectroscopy to investigate the mechanical and magnetic properties of Pd-25 at.% Fe through the Invar transition in the resistively heated diamond anvil cell. The synchrotron Mössbauer measurements revealed a collapse of the 57Fe magnetic moment between 8.9 and 12.3 GPa at 300 K, coinciding with a transition in bulk modulus found by x-ray diffraction measurements. Heating the sample under a pressure of 7 GPa showed negligible thermal expansion from 300 to 523 K (Fig. 1), demonstrating that Invar behavior can be induced by pressure in an alloy composition very different from those exhibiting Invar behavior at ambient pressure. The first-principles calculations show that pressure causes the electronic structure near the Fermi level in Pd-25 at.% Fe to become similar to that of classic thermal Invar alloys. By tuning the electronic structure, pressure should cause materials of many chemical compositions to exhibit Invar behavior. This work has been published in Physical Review Letters [M. L. Winterrose, et al., Phys. Rev. Lett., 102, 237202 (2009)]. More information on this work is posted here.